Bajoran Interceptors will no longer spawn randomly with Federation ships in content other than "Scylla and Charybdis". Resolved an issue that prevented the Phase-Shifted Personal Shield from gaining a modifier when upgraded to Epic quality. This updates existing Phase-Shifted Personal Shields to gain their Gold modifier. Added missing gold modifiers to some Nukara Web Mine Launchers and Vaadwaur Cluster Torpedoes. Resolved an issue where Fleet Secondary Deflectors could roll out of their unique modifiers into other Secondary Deflector modifiers. Items in this incorrect state have had their incorrect modifier replaced with one that is appropriate. Resolved an issue that allowed some Impulse Engines to be obtained with Multiple [Aux] modifiers. Existing Impulse Engines with duplicate [Aux] modifiers have had the duplicates replaced with [Spd] modifiers. Resolved an issue that caused the "Harrying Maneuvers" Starship Trait to force the player into combat. Resolved an issue that caused the outgoing damage to ignore resistances. The maximum amount of outgoing damage that can be dealt from a single heal is now capped at 50,000. Resolved an issue that prevented the flight speed debuff on the Lorca Maneuver from being resisted. Updated the description of the Unstable Anomalies Starship Trait to be more accurate. The Boolean Heavy Assault Cannon can now interact with Re-engineering. Resolved an issue that caused some Resonating Tetryon weapons to gain a second [Chance] modifier when upgraded. The second [Chance] modifier on existing items has been replaced with a [Dmg] modifier. Resolved an issue that could cause the Automated Aggression Starship Trait to activate multiple times from some bridge officer abilities. Concentrate Firepower's free high yield no longer takes precedence over any torpedo firing mode, and no longer prevents the player from activating any torpedo firing mode while available to fire. Resolved an issue where the Kentari Missile Launcher's High Yield would not give the player the Concentrate Firepower buff. Resolved an issue that caused Concentrate Firepower to show an incorrect debuff duration. Advanced Fleet Andorian Phaser Weapons have been removed from all Fleet Starbase stores. Existing versions of these weapons are unchanged. 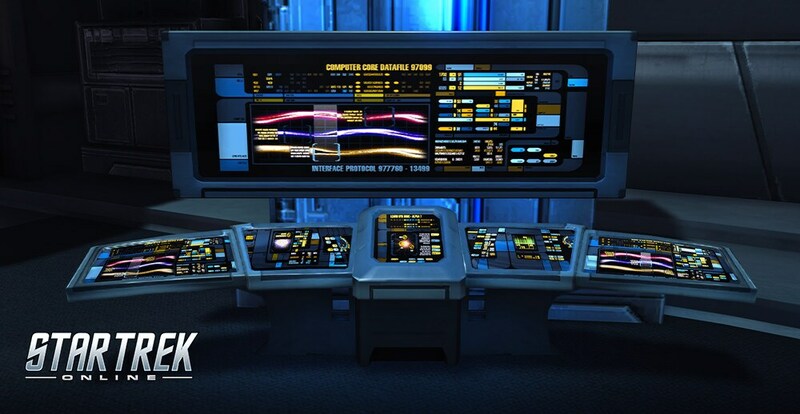 Andorian Phaser Weapons obtained from the Dilithium Store may now be upgraded, and re-engineered. Resolved an issue that caused the Energy Siphoning Field passive ability on the Bajor Defense Cores to trigger secondary deflectors. The new Dewan ships flicker on the character login screen. Console Universal D.O.M.I.N.O. has not yet been included in the Alliance Dogfighters Console Set.